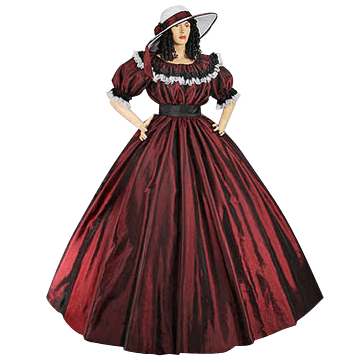 The Dark Red Civil War Dress is a beautiful example of a renaissance-styled dress that remained popular in fashion throughout the U.S. Civil War. This elegant dress is made of elegant, high-quality materials, which only add to its appearance. Made from high-quality taffeta, this dress behaves quite similarly to silk, down to the look, the feel, and even the illustrious shimmer. This beautiful dark red dress features a raised waistline which is decorated with a black band that is secured at the back of the dress with a knot. Black ruffled trim and white ruffled trim decorates the elaborate, pleated collar. The half-length sleeves are primarily loose-fitting but are fitted to the arm via a black-on-white ruffled cuff just above the elbow. The Dark Red Civil War Dress is fastened with a zipper on the back, while the interior is fully-lined. It is pictured above using a civil war hoop-skirt to add shape to the garment, although the dress does not include a hoop-skirt. If the wide-brimmed bottom is the desired look for the dress, then a hoop-skirt or petticoat can be purchased separately, the dress can also be worn without either accessory without problem. Please note that the hat pictured above is also not included with the dress. 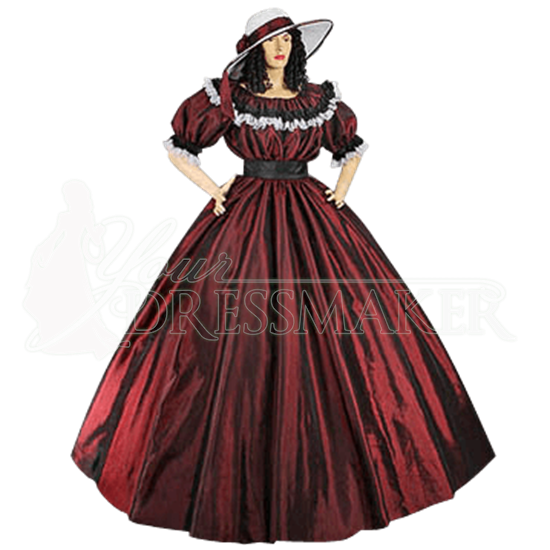 Elegant and simple, the Dark Red Civil War Dress is designed to unearth, accent, and compliment a womans natural beautyall without the need of gaudy or tasteless decoration.